Sometimes the body of the victim was the only thing that had been burnt, suggesting that the combustion had started within the body itself. A wide range of theories was put forward to explain the phenomenon, some supernatural, some scientific. At a period when candles were ubiquitous, and clothes were often highly flammable, it seems likely that these were simple domestic fires in which the unfortunate victim’s body fat was the primary fuel. However, this explanation is not always entirely plausible, and the odd case still crops up in the newspapers today. This lady was in her 62nd year, and well all day till night, when she began to be heavy; after supper she was put to bed, and talked three hours with her maid; at last falling asleep the door was shut. In the morning, the maid going to call her, saw her corpse in this deplorable condition. Four feet distant from the bed was a heap of ashes, two legs untouched, stockings on, between which lay the head, the brains, half of the back-part of the skull, and the whole chin burnt to ashes, among which were found three fingers blackened. All the rest was ashes, which had this quality, that they left in the hand a greasy and stinking moisture. The air in the room had soot floating in it: a small oil lamp on the floor was covered with ashes, but no oil in it. Of two candles on a table, the tallow was gone, but the cotton left, some moisture about the feet of the candlesticks; the bed undamaged, the blankets and sheets only raised on one side, as when one gets out of bed: the whole furniture spread over with moist ash-coloured soot, which penetrated the drawers, and fouled the linen. This soot even got into a neighbouring kitchen, hung on its walls and utensils, and a bit of bread covered with this soot, was refused by several dogs. In the room above, the said soot flew about, and from the windows trickled down a greasy, loathsome, yellowish liquor, with an unusual stink. The floor of the chamber was thick smeared with a gluish moisture, not easily got off, and the stink spread into other chambers. it was not from the lamp, nor supernatural, nor from a flash of lightening, but from her own body; though some concluded that it must be the effect of a fulmen [thunderbolt]. The dogs refused the bread, because of the sulphureous stink, and nothing but a fulmen could reduce a body to impalpable ashes. But it seems there was no sulphureous or nitrous smell of fulmen, and the effects of it would not reduce a body to impalpable ashes. The fire was caused in her entrails by inflamed effluvia of her blood, by juices and fermentations in the stomach, and many combustible matters abundant in living bodies, for the uses of life; and lastly by the fiery evaporations which exhale from the settlings of spirit of wine, brandies, &c. in the tunica villosa of the stomach, and other fat membranes, engendering there (as chymists observe) a kind of camphor; which, in sleep, by a full breathing and respiration, are put in a stronger motion, and, consequently, more apt to be set on fire. These flames seem harmless, but it is only for want of proper fuel. Peter Bovisteau asserts, that such sparkles reduced to ashes the hair of a young man. John de Viana, in his treatise, intituled, De peste Malagensi, relates how the wife of Dr. Freilas, physician to cardinal de Royas, archbishop of Toledo, sent forth naturally, by perspiration, a fiery matter, of such a nature, that if the roller that she wore over her shift was taken from her, and exposed to the cold air, it immediately was kindled, and shot forth like grains of gunpowder. It is said the old lady was used, when she felt herself indisposed, to bathe all her body with camphorated spirit of wine; and she did it perhaps that very night. 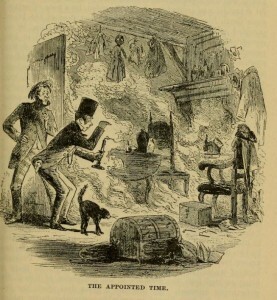 This is not a circumstance of any moment; for the best opinion is that of the internal heat and fire; which, by having been kindled in the entrails, naturally tended upwards; finding the way easier, and the matter more unctuous and combustible, left the legs untouched; the thighs were too near the origin of the fire, and therefore were also burnt by it; which was certainly increased by the urine and excrements, a very combustible matter, as one may see by its phosphorus; Galenus says, That the dung of a dove was sufficient to set fire to a whole house. A sceptic might point out that an old lady who was in the habit of bathing in flammable liquids before going to bed in a room lit by naked flames was a walking fire hazard.